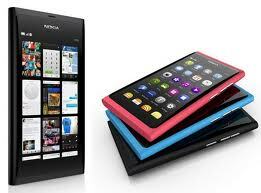 Nokia N9 is the world's Most famous Touch screen smartphone.Nokia mobiles are world largest selling phone and products are guaranteed most satisfied customer.After the great success of Nokia N8 they had introduced new version Nokia N9 and this phone as all feature which all smartphone have and no front facing button and completely operate on touch. Display:- Nokia N9 has 3.9 inches with Gorilla glass display AMOLED capacitive touchscreen and 16 Million colors display with Anti-glare polariser , Accelerometer sensor for UI auto-rotate so that when you rotate phone screen will automatically adjust to it position . Internal storage memory 16/64 GB storage as your memory increase price also increase . Connectivity:-GPRS and EDGE with class 33 and 3G Support speed upto 14.4Mbps, with A-GPS support, Ovi Maps. Camera:-It has a 8 Mega-Pixel atuo focus Camera which can be operated with a dedicated camera button. The Camera has dual LED Flash and a 28mm wide Lens. It also enables 16:9 720p HD video recording. It also have feature like Geo-tagging, face detection, touch-focus. Operating System:- MeeGo OS, v1.2 Harmattan , MeeGo is a cross bread Mobile Operating System which was produced by mating Nokia’s Maemo and Intel’s Moblin software platforms to form a fully linux-based and open source Operating System. Nokia has always wanted to shift its devices to a Linux-based OS but never supported Android for that cause, and so they (Nokia and Intel) merged there projects to create a whole new and better OS.